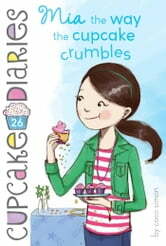 Mia learns that you have to make your own luck—rather than rely on fun trinkets—in the latest addition to the Cupcake Diaries series. Mia is having a truly terrible week. So far she’s failed a pop quiz, ruined a batch of cupcakes, and even dropped some icing on her favorite shirt! But her cousins from Puerto Rico are coming to visit, so Mia has something to look forward to—and they even bring her a little lucky charm as a gift! When Mia’s luck immediately turns around, she’s convinced that her lucky charm really does have magic powers. But what will she do when her bad luck returns? It was a great book and has an unexpected twist. I LOVE Coco Simon's books and can't wait for the next one!